While Jeremy Grantham may have been late in observing last week that the market is now caught in its final terminal "melt up" phase, he certainly looks spot on in the 4 or so days since his note of warning, because just 5 trading days into the new year, and equities - both in the US and around the globe - are smashing records left and right as market moves become increasingly exponential, making a mockery of analyst year-end targets. 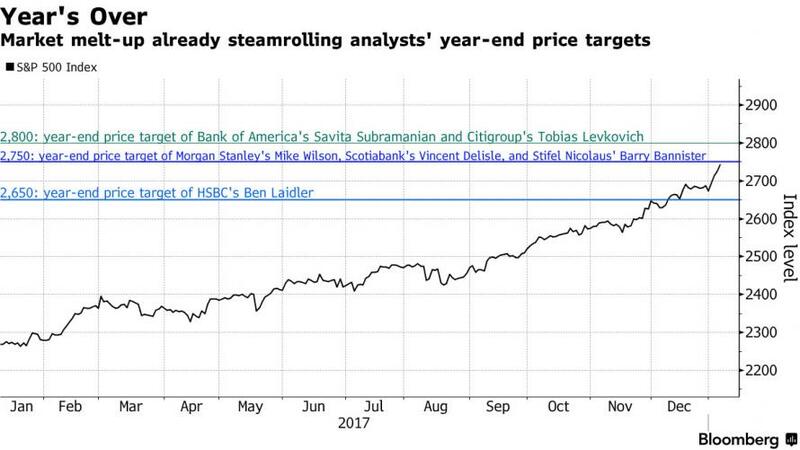 ... Bloomberg today points out that after capping a fifth straight gain on Monday, and rising 2.8% YTD to an all time high of 2,747.71, leaves the S&P just shy of the 2,750 level where a quarter of Wall Street strategists - Morgan Stanley’s Mike Wilson, Scotiabank’s Vincent Delisle, and Stifel Nicolaus’s Barry Bannister - see it finishing the year. It already surpassed the 2,650 price target of HSBC’s Ben Laidler before the year even began. Other analysts - not wanting to get steamrolled by the melting up juggernaut - have been more sneaky, or perhaps the word is "fluid", and have been bumping up their 2018 price targets, with both Harvey and Jonathan Golub of Credit Suisse Group presenting a more bullish outlook for U.S. equities in the final 10 days of the year. The magnitude of the positive revisions to earnings by companies on the S&P 500 understates the positive impact the tax cuts will have on corporate America, says Credit Suisse’s Golub. "Analysts have adjusted their 2018 forecasts by less than 2 percent for recent tax changes, a fraction of the likely impact," he wrote in a note on Monday. But just like 2017, when the S&P 500 Index ended more than 175 points above the most optimistic price target heading into the year, Bloomberg notes that "the melt-up may steamroll even the sunniest of views." Unless, of course, the market crashes between now and then as Bank of America's Michael Hartnett believes may well happen. 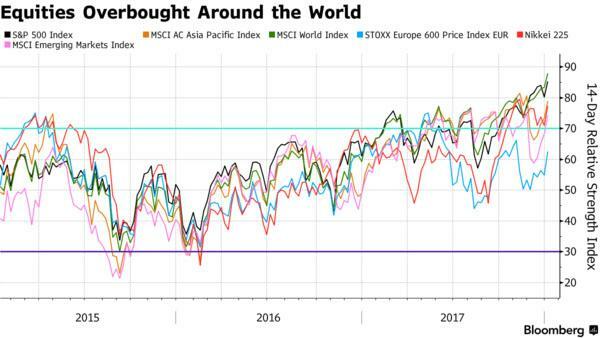 Meanwhile, there are no sign of an imminent crash, quote the contrary: global investor euphoria has pushed virtually all global equity indexes to overbought levels. Meanwhile, those who skeptically look at either overbought technicals or fundamentals which screams the market has never been more overvalued, are already losing sleep over the imminent redemption notices. As Bloomberg candidly admits in a separate note, on Wall Street, where pundits spent a decade warning people not to get hurt in the market, the mantra has become don’t get left out. "Stocks are surging and signs of receding skepticism are everywhere. Broker clients are adding stocks hand over fist. Price targets meant to last a year, last days." Making life for the skeptics especially difficult is that the great unknown from the Trump tax cuts happens to be optimistic: Donald Trump’s tax program is pushing up profit estimates faster than any time in five years. Data on everything from manufacturing to employment and housing is breaking in the bull’s favor. Nobody seems to mind that the S&P 500 Index trades for around 23 times earnings. It was higher than that only about 1.5 percent of the time since 2003. Terrified of underperforming their peers, FOMO - or fear of missing out - has turned bears into bulls, even as some of the S&P 500’s technical indicators are close to levels that ring alarm bells. 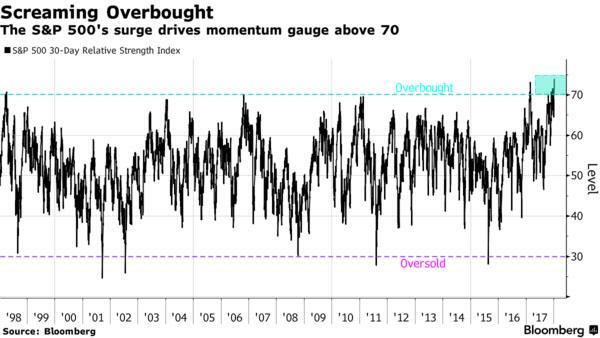 The index’s 30-day relative strength index on Monday jumped to 74, near the level last seen before the dot-com bubble, Bloomberg shows, calling it by its technical name: "screaming overbought." In another example of the "historic euphoria" gripping markets, retail clients TD Ameritrade are among those shrugging off valuation concerns and loading up on shares. They have boosted equity allocations in December for an 11th straight month, one of the longest buying streaks for retail investors the firm has ever recorded. 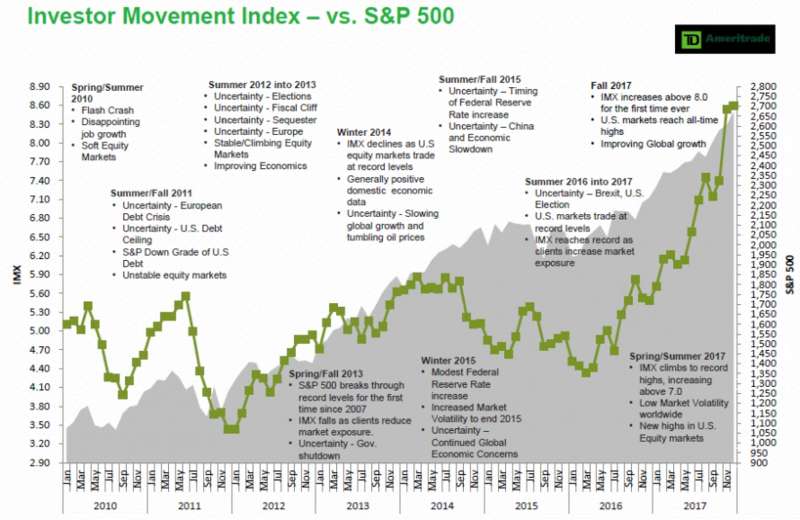 That helped push TD Ameritrade’s Investor Movement Index, a measure that has tracked client positioning in the market since 2010, to a record for the second month in a row. "Clients continued the strong buying we saw all year," JJ Kinahan, the chief market strategist at TD Ameritrade, said in a statement. "The retail investor continues to participate in the rally and has done so in a very measured way." One can't blame them: the S&P 500 hit all-time highs 62 times last year only to jump the most in 13 months during the first week of 2018. Meanwhile, nobody is talking about "money on the sidelines" anymore: animal spirits have supplanted fear in a market that hasn’t had a 5 percent correction since Britain’s secession vote. 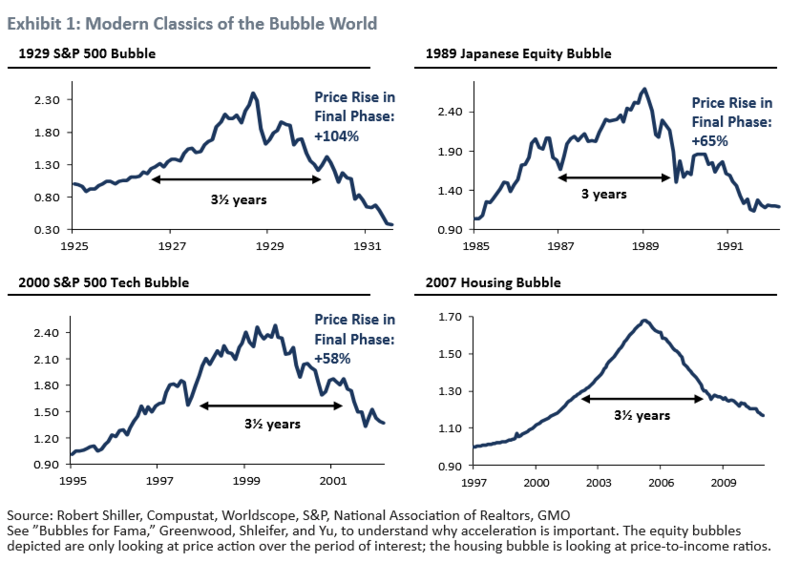 It’s getting reminiscent of the great stock market “melt-up” of the 1990s, or maybe a “blow-off top” characterized by extended readings in momentum indicators, said Gina Martin Adams, chief equity strategist at Bloomberg Intelligence. Low interest rates are one thing that support higher valuations for U.S. equities and may “warrant caution against bearish forecasts” on future stock returns, according to an economic letter by Thomas Mertens, Patrick Shultz and Michael Tubbs of the San Francisco Fed’s economic department. Low rates have been accompanied by reduced volatility in financial markets, driving up stock valuations. What is also known is that Janet Yellen's first warning about "market froth" nearly 4 years ago took place when the S&P was about 30% lower. It clearly hasn't had an impact on animal spirits, and until and unless the Fed does something to stop the current mania dead in its tracks, the acceleration into the final bubble melt up will only accelerate. ... but one thing that is absolutely certain: the higher the S&P rises during this final phase, or rather the higher the Fed allows the S&P to rise, the more painful will be the eventual hangover.